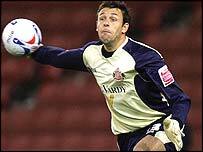 Sunderland goalkeeper Darren Ward, 33, has announced his retirement from Wales international duty. "Darren has told me he would prefer not to be considered, it is his decision so I will respect it and look elsewhere," said Wales manager John Toshack. "He would have been in contention, considering that Danny Coyne is not in the side at the moment at Burnley. "Darren has had a fine season with Sunderland and he can look forward to playing in the Premier League." Toshack was delighted with the unexpected news that key defender Danny Gabbidon is back from a groin injury and in contention for the forthcoming games with New Zealand and the Czech Republic. "Danny has had some more surgery done on his injury, and it has gone very well, he is very upbeat," said Toshack. "He is certainly now a possibility, he should be back in full training very soon and West Ham have said their season will be over by then and they are more than happy that he can play for us. "Danny is a vital player to our system, we struggle to play the way we want when he is not involved. We need him for the Czech game. "It is one we have to win to have any hope of qualifying. A win against them will put us four points behind them with a game in hand. That is the positive way we must look at this game." The Wales camp will also assess the back injury being carried by new recruit Freddy Eastwood. "When I saw him play at Plymouth recently, he was definitely struggling," said Toshack. "But we have called him in because he has declared his commitment to Wales, and we are very short of strikers these days. "Eastwood, Daniel Nardiello and Robert Earnshaw will have their chance because we will have people in the Champions League final." Barnsley striker Nardiello, 24, was once part of the English FA youth set-up and declined a previous invitation to play for the country of his father. He was born in the west Midlands, his father Don having become a policeman there after playing for Coventry. "Maybe his father has had a word with him," said Toshack. "He did once say he did not want to play for Wales, but it has been almost a year now since he changed his mind. Injury robbed him of a chance last season." Winger Don Nardiello won two caps during the mid-1970s, one alongside Toshack. The last father and son pairing to play for Wales was Mel and Jeremy Charles. Mel was a regular in the Wales squad that played in the World Cup in Sweden in 1958, while his son Jeremy was capped in the 1980s.